The Department of Water Resources and Environmental Engineering is one of the five departments of the School of Civil Engineering of the National Technical University of Athens (NTUA). NTUA is the oldest technological university in Greece, founded in 1837. The Department was established in 1982 according to the Higher Education Act 1268/82. 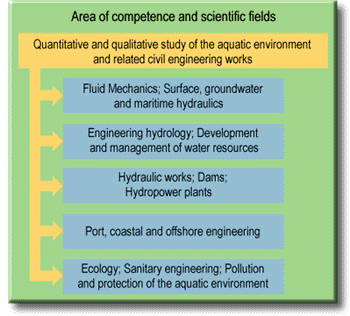 The main scientific areas dealt with by the Department relate to both the qualitative and quantitative aspects of the aquatic environment and the related civil engineering works. The permanent staff of the Department of Water Resources consists of 21 academics and 30 members with permanent professional status (teching assistants, administrative, technical and research support staff). In addition, about 60 scientists work in the Department as doctoral or post-doctoral students and research collaborators.